Violence in the Hatfield family continued long after the feud with the McCoys. 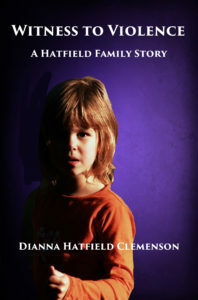 Dianna Hatfield Clemenson, daughter of Paul Hatfield, takes the reader into her violent childhood homes. She not only tells of extreme physical abuse and the effect it had on her mother and sister, she also shares her own struggles in a world of neglect and abuse. Witness to Violence is a true story of how perseverance, kind strangers, and faith can combine to make survival possible. This entry was posted in Hatfield Books. Bookmark the permalink. ← What Prison Do You Live In?